Bamboo pillows are causing quite the uproar in the pillow industry today. They have elicited a lot of mixed feelings from users. The benefits accrued from bamboo pillows will differ from one person to the next. It, therefore, pays to do a little homework before purchasing one of these pillows in order to make an informed decision. Since bamboo pillows seem to be the newest trend in the market, many manufacturers have caught on and introduced their own versions of the pillow into the market. With every manufacturer claiming to have the best bamboo pillow in the market, it can be rather difficult to discern good quality ones from the fakes. It is for this reason that we have prepared this guide. Stay with us a little longer and learn about bamboo pillow. Hypoallergenic: Bamboo pillows help to improve sleep by making sure you are sleeping in an allergen free environment. They have been said to ward off dust and other allergenic components that may irritate you as you sleep. They are also said to be dust mite resistant and anti-bacterial, properties that add to their hypoallergenic feature. Improved breathing: By being hypoallergenic, they improve their users breathing as they sleep. It is for this reason that they come recommended for asthma sufferers, snorers and others with breathing problems. While they may not completely rid their users of them, they help to make their sleeping experience a lot more comfortable. Heat Resistant: Bamboo pillows help to dissipate heat due to the breathability of the fibre. This in turn helps to keep them cool throughout your sleeping session and avoids the interruption of your sleep due to constantly having to wake up and flip the pillow to its cooler side. Their ability to absorb moisture also helps to improve sleep since it keeps the pillow from being dump and uncomfortable to sleep on. Environmentally Sound: Bamboo pillows help to protect the environment. They make use of bamboo, a crop that is fast growing and adaptable to varying soil conditions. It makes use of land that would be otherwise considered as waste land. Another plus from an environmental stand point is that bamboo can be grown without the use of herbicides and pesticides whose residues end up polluting our soil and water. Lastly, since these pillows make use of natural fibres, they are easily compostable and can, therefore, enrich the soil after use. Adjustability: Since they are filled with shredded memory foam, these pillows can be adjusted and moulded into the desired shape and loft of the users. This makes it easy for the same pillow to be compatible with different sleeping positions and meet the varying needs of users. A bamboo pillow is essentially a memory foam pillow that incorporates a bamboo-derived fibre for the manufacturing of its outer cover. It is here that these pillows derive their classification as bamboo pillows. This woody and rough fibre is subjected to a chemically infused manufacturing process whose end product is the viscose rayon fibre that is used for the manufacturing of the pillow covers. A notable chemical that is used in the process is carbon disulfide. The use of this chemical in the manufacturing process takes away from the pillow’s environmental friendliness. Prolonged exposure of humans to carbon disulfide has so far been associated with damage to the central nervous system, developmental and reproductive problems, breathing problems, as well as increased prevalence of lymphatic leukaemia. To make this pillow as comfortable as possible, it is filled with shredded memory foam. This enables users to easily adjust the firmness of the pillow to one that is adequate for their needs. The upside to this is that it not only makes the pillow compatible with different sleeping positions, it also improves the breathability and consequently the heat dissipation ability of these pillows. As earlier mentioned, the benefits accrued from the use of these pillows are a highly specific and personal matter. While there are some general benefits such as the overall comfort of the pillow that are applicable to everyone, some users, due to one condition or the other, are bound to enjoy the use of these pillows more. Now that we have a working understanding of what makes a bamboo pillow and how they come into being, it is time we looked at the key features to look out for when we are shopping for one. Filling Material: Bamboo pillows are typically filled with shredded memory foam. However, the increased market completion has seen the introduction of gel-infused memory foams, bamboo derived viscose fillings, as well as aloe vera fillings. Gel-infused fillings and aloe vera fillings tend to be softer than the usual shredded foam filling but just as supportive. 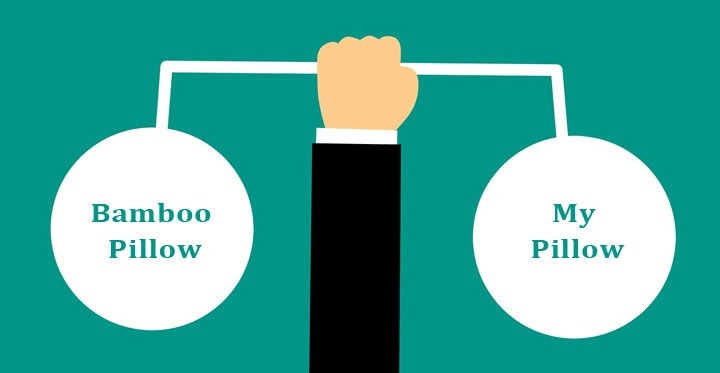 Brand Reputation: Some brands have made a name for themselves in the pillow market and are associated with the production of high quality, comfortable and supportive pillows. Other brands are associated with the production of poor quality pillows. Knowing which end of the quality spectrum a brand falls is important as it gives you an indication of what to expect from the pillow you are about to purchase. Warranty: Just like the brand reputation, the warranty period is an indicator of quality. A pillow with a long warranty period is one that the manufacturers have confidence in its performance. The warranty period is also a good indicator of the expected life span of the pillow. Size: The size of a pillow is an important determinant of comfort. Compare the size of the pillow to the available space and match it accordingly. Also compare the pillow size to your size. This will help you determine the right and comfortable size of pillow to use. Ideally, the size of the pillow should be proportional to the size of the body. This means that if you are a petite person then a smaller sized pillow is best suited for you and vice versa. By now you know pretty much all there is to know about bamboo pillows. The question that remains unanswered is which one is the best? If you simply search for the best bamboo pillow on the market today you are bound to be met with a plethora of options from which to choose from. 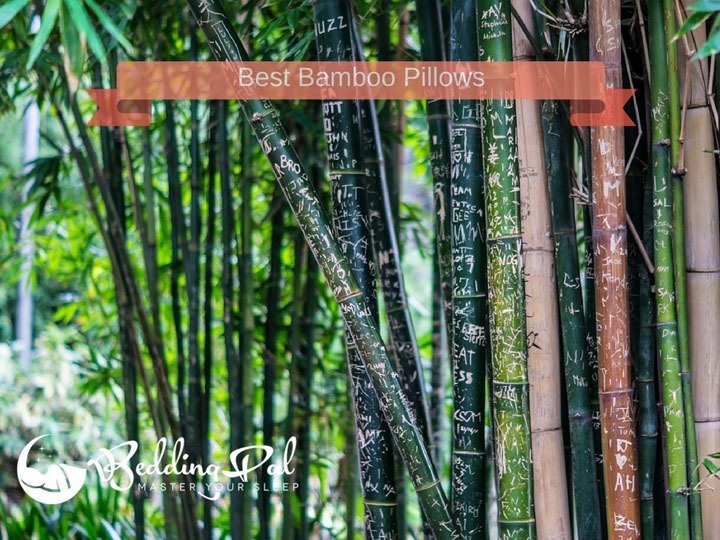 We have taken the liberty of reviewing five of the top rated bamboo pillows on the market, including the advantages and disadvantages that come with each of these pillows. Bamboo pillows are famed for their breathability and adjustability. It is the Snuggle-Pedic Ultra-Luxury Bamboo Shredded Memory Foam Pillow’s ability to live up to these expectations that earns it a spot in this review. Apart from the natural breathability that comes with a bamboo pillow, this pillow makes use of a micro-vented cover along with Kool-Flow Technology to improve airflow within the pillow and ensure its breathability. The overall effect of this is improved heat dissipation and a cool pillow. While the adjustability of the pillow due to its shredded filling is a plus, Snugle-pedic goes the extra mile to ensure that you have the right pillow for your needs. Buyers have the option of consulting a sleep expert from Snuggle-Pedic for proper pillow adjustments that match their needs. Its shredding is also thicker making the pillow firmer than most bamboo pillows in the market. For ease of maintenance, its cover is removable and washable. It also comes with a 20 year warranty and a 4 month money back guarantee. Sleeping on one’s stomach can tend to be rather uncomfortable and is highly discouraged by medical practitioners. However, for some people, this is the only way to fall asleep. The Xtreme comforts slim hypoallergenic shredded memory foam pillow takes into consideration the needs of stomach sleepers in its design. It is for this reason that the guide would be incomplete without its mention. It makes use of a thin profile but competes equally with other bamboo pillows in terms of support offered, comfort, heat dissipation and breathability. The thin profile is necessary as it keeps stomach sleepers from raising their heads and craning their necks in an awkward position as they sleep. This in turn helps to reduce strain on the neck and back muscles, allowing the user to enjoy a comfortable night’s sleep. It comes with a six year warranty and a 30-day money back guarantee. The ability of the Zen Bamboo Ultra Plush Gel Pillow to provide comfort and to hold your head in place as you sleep is what makes it one of the top-rated bamboo pillows on the market today. The extra comfort derived by this pillow’s users is as a result of the use of a gel filled fibre. It is designed to hold your head in place even as you shift occasionally in your sleep. This coupled with its breathability is a recipe for a comfortable night’s sleep. To make it easy to maintain, the pillow is designed to be stain resistant. It also comes with a thirty day money back guarantee. For an entry level pillow, users have found it to compete favourably with some of its high end counterparts. A down side to this pillow may be the fact that the cover is not removable making it rather difficult to clean. This is, however, corrected for by the fact that it is machine wash friendly. The Sleep Whale premium adjustable shredded memory foam pillow has gained popularity in the pillow industry due to its competitive price point and adjustability. Since one has the liberty to add and remove the shredded foam filing in order to achieve the firmness and loft that is suitable and compatible with your sleeping position of choice. The removable case is made of a bamboo and polyester blend in proportions of 40% and 60% respectively. This makes the cover soft, comfortable and breathable. The cover is also removable and can be machine washed and is compatible with use in a drier. This way, you get to enjoy a clean and comfortable pillow every night. Its ability to conform to the natural contours of the body makes it a suitable pillow for those suffering from neck pains. The original miracle bamboo shredded memory foam pillow takes credit for being one of the forerunners in the bamboo pillow industry. It is associated with comfort and the ability to be adjusted to suit the user’s needs. It is for this reason that it is included in this guide. The use of shredded foam also makes it possible for users to adjust the height and firmness of the pillow as needed. It can easily be folded up and packed for those long trips and camping experiences. People who suffer respiratory problems may find this pillow to be helpful. Thanks to its hypoallergenic, anti-microbial and dust mite resistant properties, this pillow helps to keep potential irritants at bay. My Pillow has marketed its products as comfortable and affordable alternative to bamboo pillows and down pillows. The pillows make use of a patented interlocking poly-fill to ensure that the pillow provides proper support for and comfort for the users. Like, bamboo pillows, these pillows have elicited mixed reactions in the market. When compared from a usability stand point, both bamboo pillows and my pillows are compatible with a variety of sleeping positions. Bamboo pillows, however, outlast their My pillow counterparts. Both pillows can be maintained by machine washing. While they are both soft and comfortable, users prefer bamboo pillows to My pillows in this regard. Bamboo pillows outdo My pillows when it comes to heat dissipation. Unlike the latter, bamboo pillows are breathable and thus have the ability to remain cool throughout the night. When it comes to choosing a good pillow, comfort and durability are key factors to consider. In this regard, bamboo pillows are superior to My pillows and therefore the best choice between the two. To ensure the longevity of your pillow, you need to know how to take care of it from the minute it is delivered. We are often tempted to reap open the packaging with the first thing we can find. It is, however, advised that you avoid the use of sharp objects when opening the package. Give it enough time to air out and to fluff out to its full form. Cleaning the bamboo derived covers can be done using a washing machine and can be tumble-dried. It is advisable to use warm water and a gentle cycle setting when washing the cover. The inner cushion is however not compatible to machine washing. To clean it you either have to spot clean or hand wash and air dry it. The recommended frequency of washing is between two to four months. However, people who suffer allergies may do it more frequently. Avoid the use of heat sources such as steamers, blow driers and irons on your pillows as they jeopardize the integrity of the pillow. Also avoid the use of chemical solvents. When it comes to storage, ensure that you store it in a cool dry place at an optimum temperature of about 500F and 1000F. Also ensure that it is stored horizontally and that no excess weight is placed on it. Bamboo pillows if used right offer a number of health benefits. The fact that the raw material of choice is a fast growing plant that requires minimal chemical input makes these pillows a rather sustainable option. However, keep in mind the chemical intensive rayon fibre manufacturing process before you decide whether or not you would consider these pillows truly environmentally friendly and toxin free. Users of these pillows have reported improved comfort and better sleep. Be sure to look out for the comfort, quality and durability aspects of any bamboo pillow before splurging on it.